We believe the most knowledge comes from learned experience… that’s why we partner with individuals who have first hand knowledge of living in poverty and using the agency resources available in Asheville City. 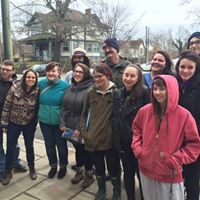 We offer educational opportunities led by individuals with direct experience living in poverty and/or houseless in Asheville City. Our poverty scholars work with grade schools, college classes, community/church groups, businesses, organizations, and interested individuals. Learn first hand about the agencies available, as well as personal experience(s) being served and challenges faced daily. Where can folks use the bathroom? See the streets, if only for a few hours, through the eyes of those who must navigate them to meet their basic needs. Begin to realize the power in our connectedness. Poverty hurts us all. * If there are physical limitations that hinder you or your group from walking 1 mile please contact us, we have options for educational opportunities. "I would explain that this is the most eye opening thing I've done and tell people's stories." "Amazing educational experience that will motivate you not only to make a difference but to treat each other with dignity as well." "I would tell them this experience was indeed an eye-opener..."
"I would tell them that it is highly recommended. It will make you look at the problems in America. It will make you think differently but also encourage you to change it."